Our readers are usually those who like to think about and question everything. They are often atheists, but not always. Sometimes they are curious folks who are willing to broaden their horizons, and occasionally we get the odd angry fundamentalist. Most of our readers are not the sort who are looking for confirmation bias, and will verify what we say in our articles with as many different sources as possible. As such, we try to provide many links within our articles from reputable scientific/medical sources where possible, but we also encourage our visitors to keep on reading and questioning. Science, unlike religion, will change its views based on new evidence. As such we are inclined to do the same. If one day it is proved that there is a God, then that will be one of our answers in reason. But with over 2,500 gods in the world, and not a shred of credible evidence for any of them, we are not going to waste our time talking about them much. We will, however, cover the various errors, contradictions, and evils in various holy books, and analyse the text to the best of our ability. One thing that we hate about religion is that it divides people; even within each faith there are further separations by denomination. It similarly saddens us that the whole “atheist” title goes to further separate people from the rest of humanity. We would much rather people work together from a humanist point of view than segregate themselves by using their religion. This is why I always feel a bit saddened by seeing atheist-only events going up. Whilst it is great to meet like-minded individuals, true growth comes from being challenged! That said, we will attend an atheistic event if there is a good cause. For example if it is against bigotry, the pseudo-scientific anti-vaxxers or someone like Aron Ra promoting science over creationism in Texas schools. 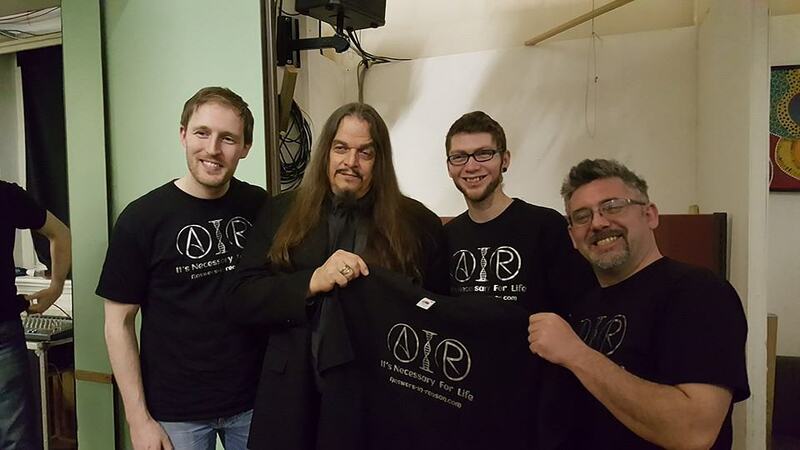 From left to right we have, Howie (AIR’s graphic designer), Aron Ra, Kriss Pyke, and Alan T.
The team all met in various online debate groups on Facebook, as mentioned in Alan’s article: Internet Atheists, FB Debating groups, and their spin offs. Between our philosophies and sense of humour we added each other as “friends”. Over time we got to know each other better, chatting ever more regularly, and eventually took the speech marks and italics off the term friends. It all happened rather fast and out of the blue. Kriss had a couple of articles on a site. The site went down. Davidian had a server that he used for a couple of blogs, and was looking for a new project. A few minutes were spent thinking of a name, which Kriss decided on. Davidian bought the domain, set up the site, and we dragged in Alan as another founder and got a few people to contribute to us. Within weeks we had a couple of hundred followers, some of our articles already viewed thousands of times and here we are. Above everything else, Answers in Reason and its authors are searching for truth. We want to spread truth and prevent people from making decisions based on hearsay, fallacious thinking, and tradition or accepted knowledge. We encourage critical thinking and evidence based decisions. The first thing to remember about atheism is, all it means is disbelief, or lack of belief in God, gods or deities. It doesn’t mean anything other than that. Some atheists are very humanistic where as others are incredibly selfish individuals. There is quite a strong correlation between intelligence and atheism, but I have also met some really stupid atheists, just as I have met some really smart theists. If Answers in Reason makes a post, that is completely on that contributor. We (or he/she) do not speak for all atheists. Other atheists do not speak for Answers in Reason. We are not a religion. We are not a tribe. We are not a community, but would like to have as many different voices as part of the Answers in Reason website and Facebook page. Firstly there is the term Gnostic and Agnostic which is now used as a prefix to describe both theism and atheism. This is not exactly its empirical use but is the common colloquialism. Essentially a gnostic is 100% certain their view is correct. These types can rarely be reasoned with. An agnostic is, not necessarily doubtful, but at least more open to possibility. There are similar terms with ‘hard’ and ‘soft’ atheism. Hard being the gnostic approach, and soft being the agnostic approach. It is also important to note that someone can be a gnostic atheist and an agnostic atheist at the same time. With over 2,500 different god claims, without even addressing the tens of thousands of denominational variances, it is possible to be Gnostic about 1 or more of those, but Agnostic about others. You could be a gnostic atheist with regards to the Abrahamic God, but agnostic about the Hindu gods. You could consider yourself a gnostic atheist with regards to all theistic gods, but agnostic with regards to deistic claims. A claim of gnosticism in 1 particular area does not preclude being open to possibilities in others, and is not necessarily ‘closed minded’ as people often like to accuse. Humans are tribal by nature. As much as we may try and transcend the tribe and carve out our own bit of individuality, you always end up attracting others to the group. Whilst atheists do encourage individual thought, there are those that choose to not think about things too much and go with the flow. They put their trust in those more intelligent than them, which is probably safer than having completely baseless faith. However, we would encourage everyone to question everything. Having expanded our team of authors we filt it best to give them their own page. CLICK HERE TO LEARN ABOUT THE AUTHORS OF AIR. There are a few different ways you can get hold of us. Other option include, using the comments on our site, email and Twitter. We’d like to thank all of you who read, share, and comment on our posts. And also to those who have helped improve our posts and articles in the editorial sense such as Matthew Wilson and Andy Nickols.